Sunday, March 10, 2019: During the latest chill, I snuck into the relative protectivity of the woods, which knocks the wind-chill winds down to tolerability. I headed over to a wooded West Creek zone where a “pack” of coyote has been sighted, per a reliable Facebook post. It sounds like a coyote family unit is on the move. Coyote are not “pack” hunters, though a litter will hang with parents until almost fully grown. Sometimes, blood-relative coyote will join up when it behooves hunting, for taking down larger prey -- done by exhausting the likes of whitetail deer. When organized they can be a formidable hunting unit. I know the area where they were seen very well. There have not only been numerous coyote sightings, but some outside video cameras caught their images, near an electric relay station. I found no tracks in muddy melt areas, though I did see some canine-like hairs in the briers, right where they had been seen. I will be placing trail cams out there. BITE ME NOT: There are a couple buggy factors seemingly coming into play this summer. The sub-zero nights we felt -- the Pines got down to well below zero -- might have knocked some overwintering insects and related egg-sacs for a deadly loop, potentially taking a huge bite out of the upcoming biting insect population. I’ll gladly take even one low-bite summer, compliments of the kill-off. However, another key bugginess factor will show from now until the start of summer: rain. While copious skyfall is just what the vernal pond doctor ordered to help perpetuate our flagging frog and toad populations, the wetness fully favors highly-productive bug spawns, possibly neutralizing any population loss from winter’s zero times. We’ll know soon enough. 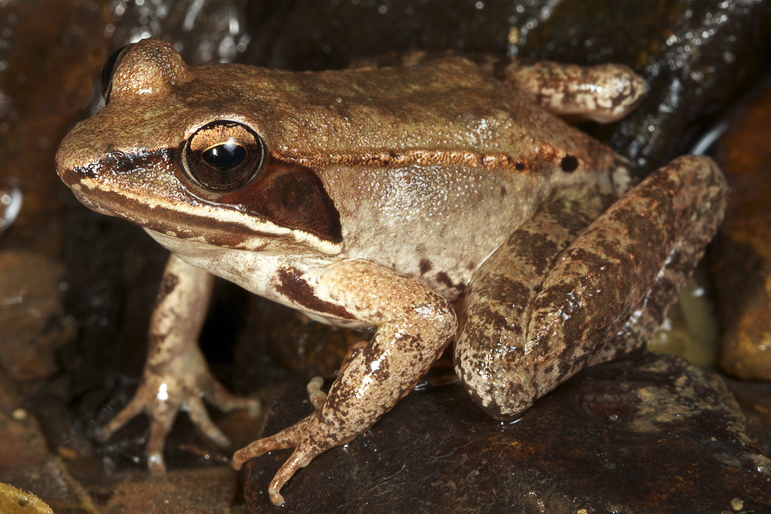 Below: The wood frog is the first amphibian to test for spring in the air. They come out early and often. Any day now, they'll take to the edges of puddles -- their favorite mating waters. If they feel a sudden late-season freeze coming on, they dive to the bottom and chill by going into a state of suspended animation. I've seen them eerily sprawled on the bottom of puddles covered with ice thick enough to stand on. When the ice thaws, it's right back to the banks of puddles. I should note that I’ve already pulled ticks off my clothing; none have reached skin yet. They have a miraculous natural antifreeze within. Zero temps to them are yawners. They’re ready to commence with blood-seeking by the next showing of sun – even when air temps are barely above freezing, as evidenced by the wood and deer ticks I attracted while hiking about in 35-degree temps. Resilient little bastards. 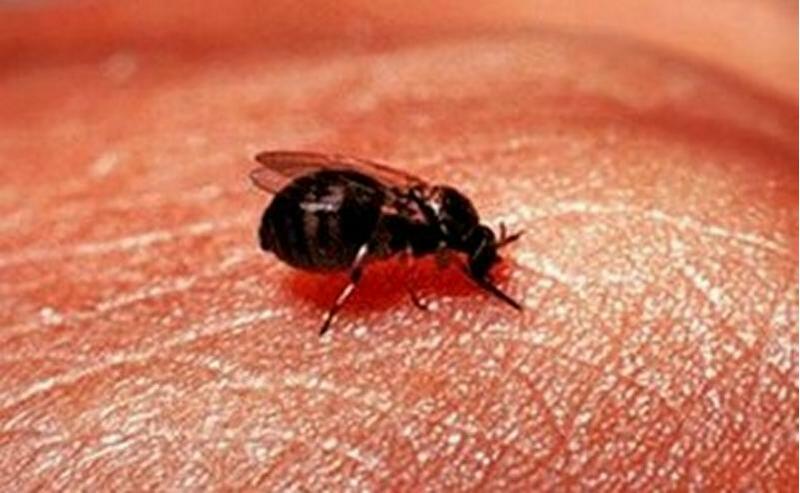 "Blacklegged (deer) tick adults are not killed by freezing temperatures. Even in the coldest regions of North America, these ticks can still be active on days when temperatures are above freezing and they’re not covered over by snow. ... Deer ticks sitting for a time on a block of ice (or frozen ground) just can't muster the energy to move their muscles. Warm them up, even just a little, and watch out...they're good to go. And they will, too." BLACK SANDS DEBAFFLED: I'm sure all y'all have been holding your cumulative breathes for an update on what the black sands of Holgate are truly made of. My initial guess of biotite mica, based on how light the mineral seemed, was thoroughly wrong. Of course, I hadn't taken much of a microscopic look-see prior to making that mistaken identity. Well, I have now gone with scoping before speaking ... and biotite is out. The black grains -- seen below times 45 -- are surely a harder component of granite. They are most likely comprised of hornblende. And that's my final answer -- though black feldspar is also a slight possibility, though feldspar takes on a leaden gray shiny surface when tumbled. It's unlikely that so much black feldspar could have come from Island's eroding jetty/groin stones. AS seen, the tumbled grains have a high shine. Since hornblende is around the hardness of 6 on the Mohs hardness scale, it can take on such a sheen. Biotite is very soft, with a top hardness of only 3. It would not become rounded granules. I think I just wanted the grains to be naturopathic biotite. I'll eventually be separating the black grains and grinding them for some further testing. Also catching my eye were a goodly number of transparent pink grains. While most likely a colored form of clear SiO2 (quartz, as in rose quartz), they deserve some closer attention. I'm on it. And it will take some serious sorting time to herd out a load of these. Attended last night's New Jersey Marine Fisheries Council meeting - here's the deal on summer flounder (fluke). At this point it looks as though we're status quo for 2019; the NJDEP officials are still mulling over the options, but in all likelihood we'll be looking at the same three fish bag and 18" size along the coast, the same season length (though mostly like start on Friday, May 24). We'll have a full write-up coming in the April edition to spell out & why they arrived at these numbers by way of NOAA Fisheries. And again, NJDEP and the Division of Fish & Wildlife are still looking any possible improvements given the federal directive. My "guess" in a nutshell at this point: three at 18 inches, May 24-Sept.21 in NJ. When I hear something different or definitive, will let you know! Here's a video look at the tall white pines that might be coming down. The New Jersey Pinelands Commission is pondering an application from the state Forest Fire Service to take down 16 acres of old-growth white pines planted in Bass River State Forest. The trees were planted in 1929 by the Civilian Conservation Corps. The Forest Fire Service feels the 100-foot-plus trees limit their ability to adequately monitor their watch area for wildfires. Numerous conservation groups are against the razing of the white pines. Dang...I reckon you don’t need real bait any longer..Benjamin Howell it is ON! It looks like I sent it to half of China! Maybe it's just because of Facebook, but we are noticing a trend these days among dedicated fishermen - lots of them are making their own lead sinkers. Lead melts at a relatively low temperature, and many sporting suppliers sell molds for casting the fishing weights. It's fun. But beware - lead dust and fumes can be extremely toxic. 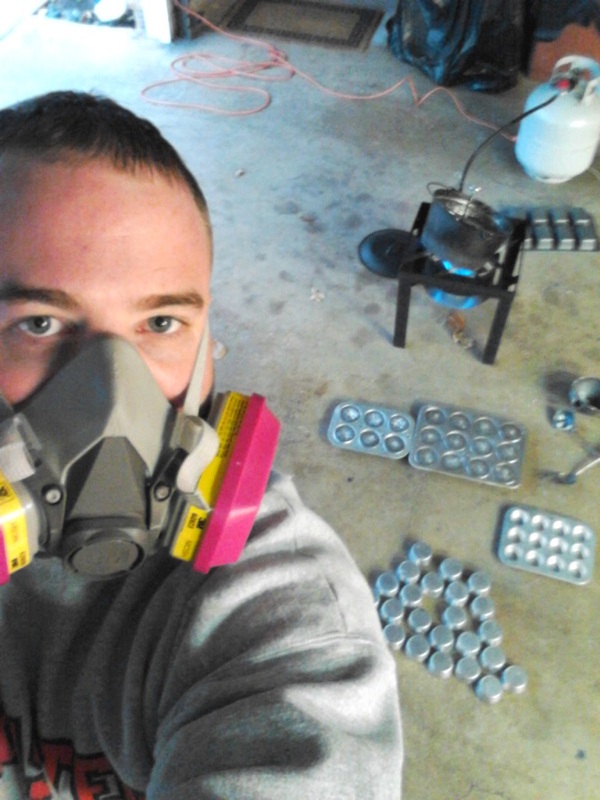 Even if you are melting and casting lead outdoors, you still need to protect yourself with a respirator. I like you folks. You seem willing to run with both my quirks/weirdness. Therefore, please accept juts a few more of by Holgate black sand photo visions. Sometimes I just get obsessed with odd stuff like this. It'll pass ... but not before I display a bit longer. Note: This website does not display photos all that well. In higher rez, they really pop. Federal grants are available to help “Made in America” companies compete with imports and save US jobs. Learn more at www.nwtaac.org. Today is Ash Wednesday - the start of Lent, a time of fasting and soul searching for hundreds of millions of Christians around the world. The word Lent derives from the Old English lencten, meaning spring. Many believers will give up favorite foods during Lent, or they’ll devote time to volunteering or charity work. And what the peak holiday selling season from Thanksgiving to Christmas means to retailers, Lent means to the seafood industry. Food Services of America, for example, reports that Ash Wednesday is the busiest day of the year for frozen seafood sales, and the six weeks following is the top selling season for the entire year. And McDonald's says it sells nearly a quarter of its total yearly Filet-O-Fish sandwiches this month. The Lenten season, which this year runs from March 6 to April 17 dates back to the 4th century. Ash Wednesday is so called from the ritual of placing ashes from burned palm branches on the forehead as a sign of repentance. The ashes symbolize the religious statement “remember that you are dust, and unto dust you shall return." In many countries, the day before Lent - called Mardi Gras or Shrove Tuesday - has become a last fling before the start of the long fasting season. For centuries, it was customary to not eat meat during Lent, which is why some people call the festival carnival, Latin for farewell to meat. While nearly all seafood enjoys a surge of interest during Lent, the most traditional items served are the so called “whitefish” species, such as cod, Alaska pollock, flounders, and halibut. But no matter what the seafood favorite, the six week Lenten season is good news for Alaska, which provides over 60% of the nation’s wild caught seafood to U.S. restaurants and grocery stores. Find links at www.alaskafishradio.com and on Facebook. London-based sushi company Ima has developed a vegan ‘salmon’ sushi set that it says will be a “game changer” for the market. FoodNavigator caught up with founder Jessica Chan to find out more. Ima, which means ‘now’ in Japanese, claims to be a “rebel ” sushi company offering vegan alternatives with a strong focus on authenticity and sustainability. The company wants to ‘redefine and reinvent’ sushi to reflect sustainability concerns and changing consumer preferences. “Back when sushi was created, sustainability issues such as overfishing were not a topic of discussion. However, they are now, so we create sushi that is suitable for the present climate - the ‘now’ - for the conscious consumer in the modern world,” owner and founder Chan explained. 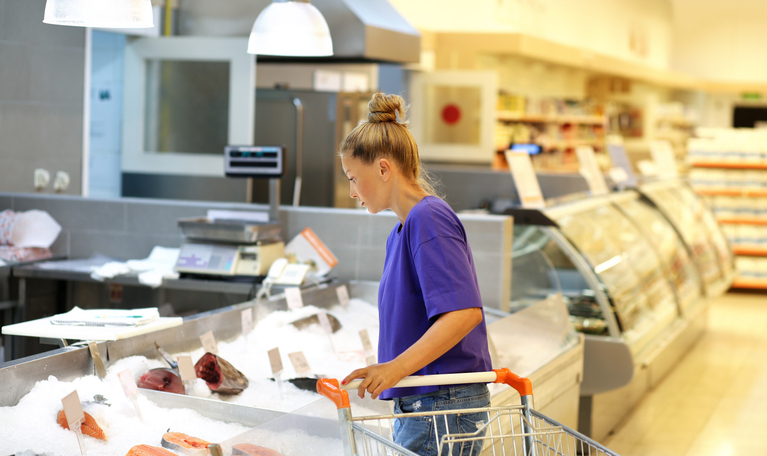 Consumers are increasingly waking up to concerns around overfishing and the health of marine environments – and this is a critical issue that Ima wants to help solve. “Our oceans and fish levels are depleting at such a rapid rate, it's just not sustainable for us to continue eating fish sushi. So we created this plant based alternative not just for vegans, but hopefully for non-vegans too. To make it easier for them to make food choices that will help fight against overfishing, without compromising on the taste or texture. They won't be able to tell the difference,” Chain claimed. Ima also recognises the impact plastic pollution has on ocean life - and its sushi range is sold in 100% biodegradable trays. While Ima is reimagining sushi, tradition is still important to Chan, who has been rolling sushi since she was six years old. Every piece of Ima sushi is hand-rolled using a traditional bamboo mat and sliced in “the little Ima kitchen ”. Indeed, Ima’s ethos very much reflects Chan’s own personal journey. She founded Ima in December 2017 after deciding to go vegan – but finding a lack of fish-free sushi options was “making it difficult”. “It was my favourite food yet the only options available on the market at the time were cucumber rolls. It felt like I had to make a choice between being vegan or never eating sushi again. Last week, the company expanded its offering with the addition of plant-based ‘salmon’ sushi sets, which were introduced to Planet Organic stores across London. According to Chan, the new SKU “looks and has the texture exactly like salmon sashimi”. The recipe for the salmon substitute was developed in-house by Ima’s development chef, who created it from scratch. It uses Konjac, an Asian root vegetable, as its base. The recipe development process was one of trial and error, Chan continued. “We tested adding multiple different ingredients with varying ratios and now we have got the texture just right, where it melts in your mouth exactly like salmon sashimi. The new product joins Ima’s roster of 12 SKUs, including vegan sushi burritos, vegan ‘tuna’ and sweetcorn sushi burrito, katsu tempeh sushi burrito and a vegan hoisin ‘duck’ sushi set. Ima is also preparing to launch a black rise vegan ‘crab’ roll later this month. Since the company’s launch, Ima was able to secure listings “surprisingly” quickly, Chan reflected. Planet Organic, the London-based speciality retailer, gave Ima its first big break after just one month of trading. Planet Organic is the UK’s largest organic supermarket, operating seven stores across London. Ima is now also stocked in Sourced Market in St. Pancras, Victoria and Marylebone train stations. Chan said Ima wants to build on this in order to reach as many consumers as possible with its ocean-friendly sushi. “We would like to be accessible to as many people as possible so we’re hoping to supply to Wholefoods and eventually mainstream retailers like Waitrose, WHSmith and Boots in the future. There's something inherently romantic about the great ships of yore: Those massive sails piercing the sky above an endless horizon. These days, of course, we've given up the sails for the brute force of fossil fuel engines. The modern shipping industry has sacrificed elegance — not to mention the environment — for volume, speed, and efficiency. But those old sails may be coming back. There's an overarching organization — the International Windship Association — that's pushing wind propulsion for commercial shipping, and liaising between various governments and entrepreneurs and researchers. But then there are the specific projects, scattered about the globe, in both private business and academia. Take the Smart Green Shipping Alliance as an example. It's working on a combination of sailing technology and clean fuel to reduce cargo ships' CO2 emissions, hopefully to zero eventually. Diane Gilpin, who founded and heads up the initiative, explained to The Week that they're working on two goals. One is a cargo ship designed from the keel up for sailing, with an optimized hull and so on. The idea has been run through computer simulations and some testing of physical models, and they think as much as 50 percent of the propulsion could come from the sails. "If we do it from scratch we can get better performance results than if we have to retrofit an existing ship," Gilpin explained. But building new cargo ships, especially technologically-advanced sailing-optimized ones, is expensive. And like much of the global economy, the shipping industry is in an uncertain spot right now. Thus Gilpin and her colleagues are also looking into retrofitting existing cargo ships. "We want a plug-and-play type system," she said: Ships come into port, they offload their cargo, the sails are installed as new cargo is loaded in, and the ship heads off again. Quick and easy. The sails would be adjustable and retractable, so they can stay out of the way of the loading dock cranes, or when the ship goes under a bridge or maneuvers into port. The group has been refining the design, getting feedback from players in the industry, and then going back to the drawing board. They're on their third iteration and hope to begin a demonstration project with a fully retrofitted ship in 2021. They think their retrofitted sails could cut 20 percent of fuel consumption. The Wind Challenger Project, which was started by the University of Tokyo, in conjunction with private shipping companies in Japan, is aiming for much the same goal: A system of sails that can be attached to current cargo vessels, that are maneuverable and retractable, and could cut fuel useby 20 percent. In a further convergence, the sails the two projects are working on even look similar: large, rectangular, multi-sectioned affairs that soar vertically from the ship's deck. Kazuyuki Ouchi, a professor at the University who leads the effort, told The Week they too hope to test a full scale model as soon as 2021. There are also some more oddball projects out there. A Danish company called Maersk Tankers is testing out giant rotating cylinders that would sit atop its cargo ships. This system takes advantage of a quirk in the physics of air circulation: By spinning, the 100-foot cylinders pull the air around them, creating higher pressure on one side of the cylinder than the other. That differential pushes the ship forward. Maersk is testing the idea out on one of its tankers, and hopes to cut fuel use by as much as 10 percent. If they're successful, they think they could use the cylinders on around 80 of their 164 ships. Then there's the Vindskip, designed by Lade AS out of Norway. In this case, the ship itself would be the sail; it's tall and relatively thin, like an airplane wing. That would allow the ship to sail more directly into the wind and still generate forward motion. The designers hope they can cut fuel use by 60 percent, and get the remaining propulsion from natural gas. It's not clear when the first Vindskip will sail, though they were looking to launch the first as soon as this year. Why all the sudden interest in wind propulsion for maritime shipping? A few reasons. One is technological advancement. The basic physics of sailing haven't changed. But modern material engineering can create sails and rigging that are much stronger and much lighter than what we could get a few decades ago — never mind a century ago. Global weather analysis and big data crunching also open up new possibilities: We've actually gotten very good at predicting how much wind a ship can expect, in the aggregate, along different routes and at different times of the year. Part of the Vindksip's appeal, for example, is an accompanying software packet that would make use of that data for day-to-day navigation. Then of course there's the climate angle. Cargo ships are only one piece of a much bigger puzzle; they account for roughly 3 percent of humanity's carbon emissions. Still, every little bit counts. Environmental concerns also bleed into economic ones. Fuel alone is around two-thirds of the industry's operating costs, and fuel prices are already rising. The International Maritime Organization — the United Nation's regulatory body for the global shipping industry — is getting ready to roll out new rules for cleaner burning fuel. It's not just carbon emissions that's a concern; it's sulfur and the like. No one in the industry is really sure how much qualifying fuel will be available, where, and when. The more cargo ships can rely on wind, the more certainty they can get regarding their operating costs. As Gilpin put it, "the wind is free and will always be free, and we can predict it." In fact, the Smart Green Shipping Alliance has an even grander vision. They'd like to use wind power to generate electricity (Gilpin got her start in wind renewables), use the electricity to generate clean fuel (probably hydrogen), and then use the fuel in conjunction with wind sailing for propulsion. Since wind would drive the entire supply chain, and wind is predictable, this approach could provide the industry a fixed and reliable price for all its propulsion needs. When fuel is 60-to-70 percent of your operating costs, and the average ship lasts 20 years or more, that's a big deal. Of course, wind won't be a panacea, either. The sails that Gilpin and Ouchi and others are working on are best applied to bulk carriers and tankers; hauling oil, liquids, or grain and such. They have the deck space. The ships with the big stacks of cargo containers don't really have the room. If you estimate the global cargo shipping fleet at 50,000, the Alliance's sails could probably apply to around 10,000 of those ships. But part of what's powering the drive to get these systems up and running is hope. Testing and experience in real-world conditions is how you learn and advance the technology. Once that process begins, who knows what we could learn, or what techniques and technologies we could still develop? Gilpin compared the possibilities to her early work in wind power: The first turbines her company built were mere 45-kilowatt machines. Twenty years later, they were constructing 12-megawatt turbines on floating offshore vessels. "What we're doing now is the critical first stage," she told The Week. "It won't be anything like what we expect in 10 years or 15 years time." Who knows? Maybe the romance of the old sailing vessels could yet return.